The North America expanded polystyrene market is expected to witness a CAGR of approximately 3.1%, during the forecasted period. The major factor driving the EPS market is the benefit EPS provides over other materials. Owing to the cost effectiveness offered by EPS, it is one of the most popular materials used for insulation in the construction industry. EPS offers the highest insulating capacity per dollar among all the materials used for rigid insulation. Furthermore, it’s costing is nearly 25% - 50% lesser than other insulation materials. Additionally, according to an experiment conducted, EPS insulation system retains just 5% moisture compared to 19% in case of XPS, when both were buried under soil for 15 years. Hence, due to such factors, EPS is gaining preference, which in turn is expected to drive the market during the forecast period. Furthermore, with the growing renovation and repair construction sector, especially in the United States, is propelling the demand for and usage of EPS in the country, consequently boosting EPS market in North American region. The construction industry is the largest consumer of EPS in North America. Owing to its lightweight, durability, thermal efficiency, shock absorption, moisture resistance, and easy-to-use characteristics, EPS is used in the building & construction sector. It is also used in making roofs, walls, floor insulation, closed cavity walls, road construction, and so on. Sheathing is one of the most basic and widely used applications for EPS insulation in residential and commercial constructions. 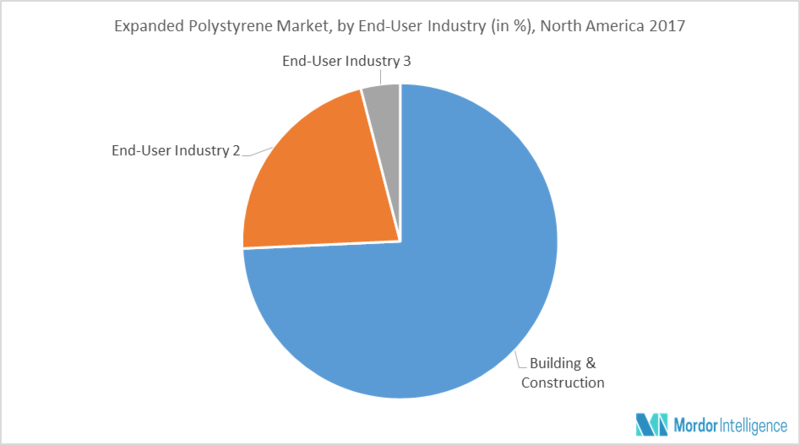 With the growth in the number of construction projects in United States, the demand for expanded polystyrene is likely to grow. These projects include expansion and renovation of the JFK Airport, Jamaica NY - which has a project value of USD 10,000 million. Other projects include the rail tunnel between New Jersey and New York, which is being developed by Newark Traffic & Signals Engineering with a project value of 10,000 USD million. There has been a growth in the construction activities and rise in renovation & repair construction activities in the United States owing to the increasing investments in the sector. Some of the major upcoming construction projects in the country include the construction of PHASE 3 of the Second Avenue Subway Project – MTA – New York City Transit with a project value of 14,200 USD million, PSE & G Nuclear Power Station in New Jersey with a project value of 14,000 USD million and 660 Fifth Avenue in New York with a project value of 7,500 USD million. This has provided growth opportunities to the EPS market in the country. Additionally, the demand for EPS, from cold chain solutions, is expected to grow with the rising demand for frozen foods. The major players include – BASF SE, LG Chem, Ravago, Sabic, and Total S.A. amongst others. 9.6 NOVIDESA, S.A. De C.V.